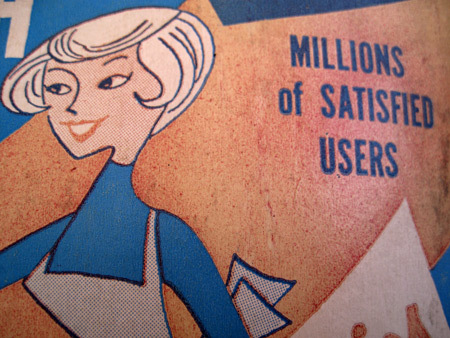 Long before Mr. Clean and Magic Sponge promised fewer steps and happy housewives came Harwood’s Sponge Cloth, one of many modern miracle kitchen products offered for the first time in history in the post-war Atomic Age to ladies of the kitchen. As chemicals developed for warfare or space travel like Teflon were trickling down to pots and pans, linoleum floors and kitchen counters, the Sponge Cloth promised to be a “Sponge and Dishcloth in One!” that “Cleans and Dries in One Stroke!” “Wet•squeeze•use” and for 35¢ lives were changed because now there was more time to run into the next room and enjoy the revolution happening in the living room, television. 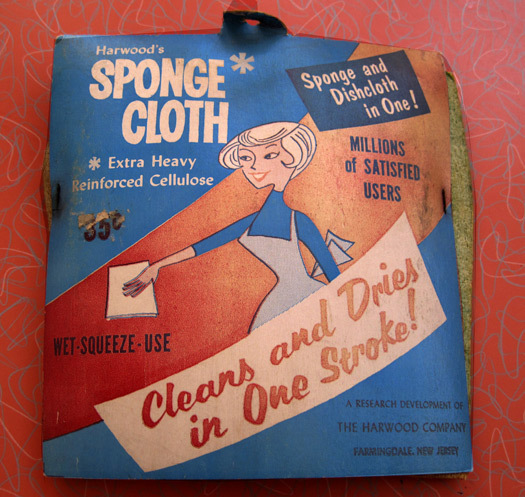 I’m always completely intrigued by people who develop a supposedly revolutionary product and then come up with a name like “Sponge Cloth”. Like a wad of mud sliding down the wall of creativity until it hits zero. Smash! A direct hit on the head of the mundane. 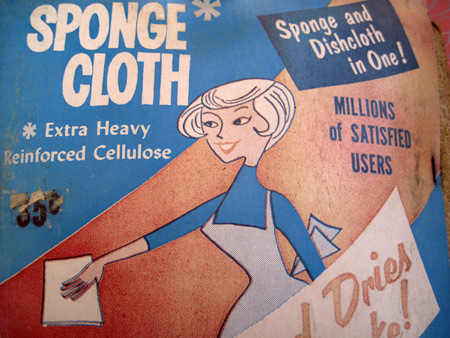 I’m sure it’s true that “Millions of Satisfied Users” lost muscle mass because of the minimal arm movement involved in operating the Sponge Cloth. 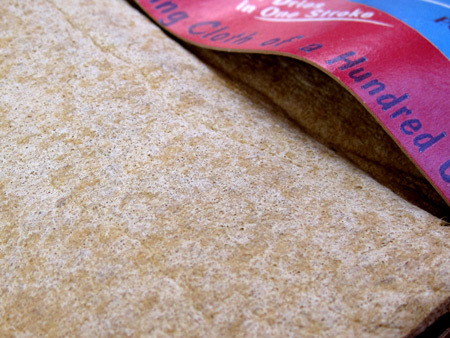 The photo actually makes the Sponge Cloth look like a normal scouring pad but in reality it looks much more like stale matzoh or a piece of insulation than it does either a sponge or a cloth. 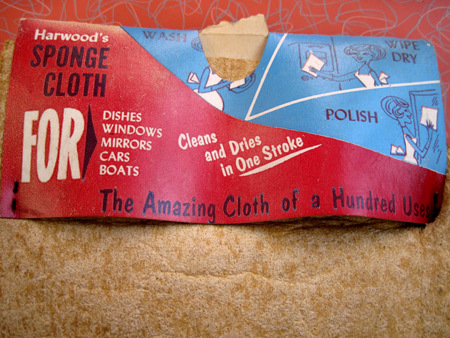 I always love when a product refers to itself as “amazing” and promises HUNDREDS of uses or, in the case of the Sponge Cloth, “a Hundred Uses” on the nose. Does that mean that the Sponge Cloth can be used 100 times or are there 100 different ways to use it? If the latter, The Harwood Company of Farmingdale, New Jersey could have gotten a little more imaginative on the big three than ‘wash’, ‘wipe dry’ and ‘polish’. But, then again, it’s the Sponge Cloth. Same guy working on the art direction as the name. As much as I disparage the Sponge Cloth, if it really was a cloth that cleaned and dried in one stroke I wish I had found a case of them instead of just one. And didn’t wait 60 years to use them. Other than the fact that it’s packaged in a 750ml bottle, the standard size vessel for champagne, the stretch to connect product with name is so thin and precarious here as to induce the medical condition known as Kitschago. As a writer, it’s painful to see so many plays on words in trying to make elements as disparate as popcorn and classical music seem connected. 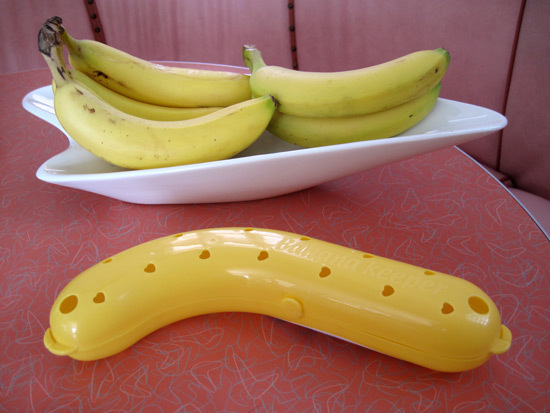 As a kitsch lover, however, it’s ecstasy. 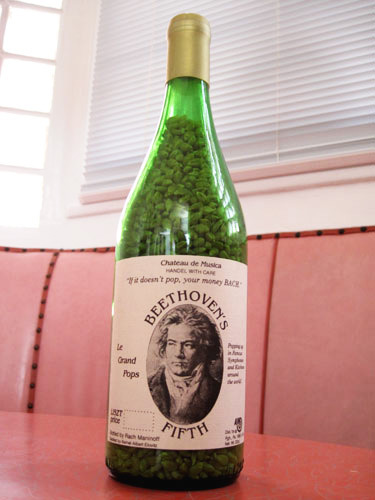 Let’s see, how many ways can we thwack the creative brain with a lead pipe and make this popcorn/ Beethoven connection work? The label, Château de Musica, implores the popcorn ingestee to “HANDEL with care”. I don’t understand what care it takes to eat “Le grand Pops” but if one does apparently HANDEL it wrong the bottler, RACH MANINOFF, guarantees “your money BACH”. 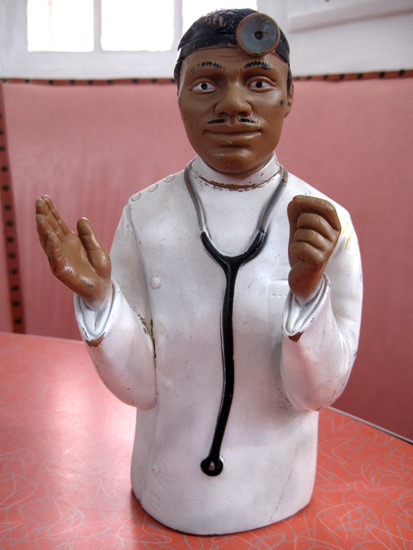 As I lie in bed with food poisoning after ingesting some of the worst food I’ve ever eaten in LA Saturday night (at an expensive downtown restaurant which shall remain nameless as I’m only 99.99% sure it was the scene of the crime and not 100), this rubber doctor puppet seems a very appropriate Kitsch O’ The Day offering. Made by Childcraft in 1968 and used in African-American classrooms to teach about good role models the set also includes two girls, two guys, one kid, a grandmother, a grandfather, a policeman and Nelson Mandela. 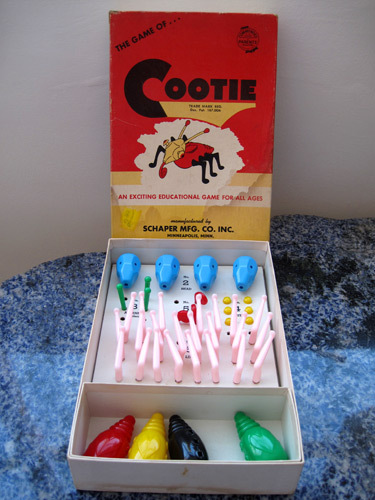 I can’t remember any game more popular than Cootie when I was growing up. 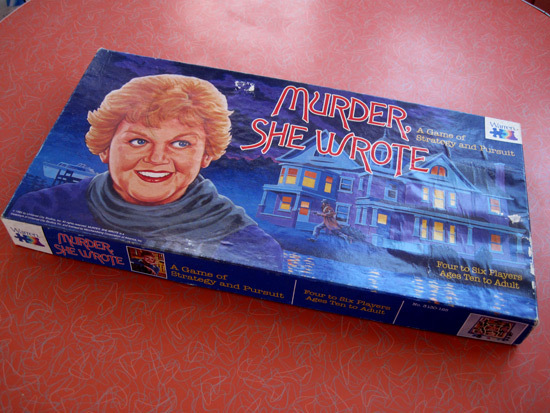 But forget about the game itself, I loved playing with the little plastic body parts. I’m quite positive that the full-on-plastic-soaked-saturation of the pink Cootie legs is where my love of that particular color came from. Every morning I wake up to a pile of notes that I’ve dropped on the floor from my bed the night before as I don’t like to keep anything in my head so I have a running chance of falling asleep. My M.O. is to scribble things down as soon as I think of them anyway so no brain space is occupied with to do lists or thoughts of any kind and creative ideas have ultimate room to race around and breed. 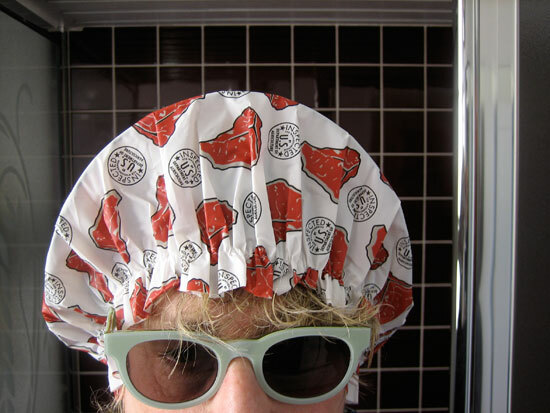 There’s nothing more I like to throw on my head to protect it from a raging shower stream than a shower cap covered with T-bone steaks. I wish it were more of a meat directory up there but, alas, despite giving the cap the general category name of “meat” only the lonely T-bone made it to immortality.